Madeline Boyer is a Senior Consultant with Percipient Partners, a Lecturer at the Wharton School and cultural business anthropologist whose work, research, and teaching focuses on new workplace phenomena: particularly shared and collaborative workspaces, and remote workforce management (leading ‘wide teams’). Madeline was born and raised in the Panama Canal Zone, is fluent in Spanish and English, and keenly aware of cross-cultural management issues–having grown up in a multi-cultural/lingual region. Madeline has worked with a wide range of clients, including leading health and research institutions, non-profits, Fortune 500 companies, and Wharton Executive Education on projects ranging from stakeholder research, change management and strategic planning, to executive development and teamwork coaching. She has lectured internationally on her work on coworking, the global shared workspace movement, and online community dynamics. 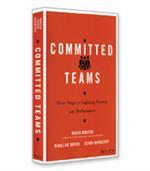 She is a co-author, along with Mario Moussa and Derek Newberry, of the forthcoming book: Committed Teams: Three Steps to Inspiring Passion and Performance (Wiley Press). This author has no contact information available.